When I was growing up, Mum always cooked with Chinese dried mushrooms. Although I maintain some of Mum's cooking methods, I prefer to use fresh mushrooms. You can use whatever mushrooms you prefer: oyster, shimeji, chestnut browns, enoki, button, field or even pine mushrooms. 2. Heat peanut oil in a hot wok until the surface seems to shimmer slightly. Add ginger and stir-fry for 10 seconds. 3. Add the mushrooms and stir-fry for 2½ minutes or until lightly golden and just tender. 4. Add green chillies and cook for 10 seconds. Add wine or sherry and cook for one minute. 5. Add soy sauce mixture and stir-fry for 30 seconds, tossing to coat everything in the sauce. Serve immediately. 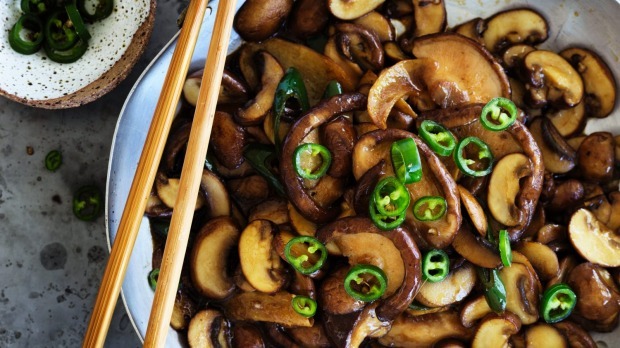 This mushroom stir-fry works as a great vegetarian complement to my spicy, sticky pork ribs.